Work continues onsite at the new George Street Pocket Park next week. 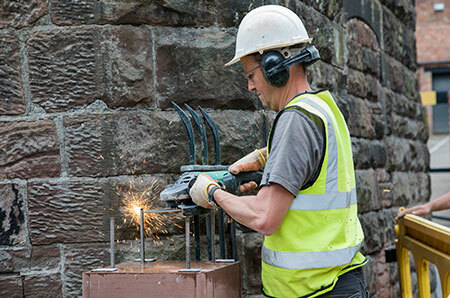 Last month the restored gate pillars were re-instated by Grosvenor Construction and the restoration of the gates completed by Flintshire Fabrications. George Street Pocket Park next to the Shropshire Union Canal runs alongside the City Walls. The park is being brought back to its former glory by Cheshire West and Chester Council. Councillor Louise Gittins, Cabinet Member for Communities and Wellbeing said: “The new park is part of our Chester Regeneration Strategy and Waterways Strategy, helping to improve the connections with the bus interchange and city centre businesses and promote the unique history of the Walls and waterways. The pocket park contains a row of lime trees that help to define the park. The park will see the restoration of the existing historic boundary including the railings, and main entrance. A new entrance has been created that will allow entry to the park on the western approach from George Street. A viewing platform will be situated at a lower level to the east of the existing site entrance, with views of King Charles Tower, the Shropshire Union Canal and the City Walls. The platform will be set at a level that allows for inclusive access from the main pathway. The pathway through the park will be inclusive for all, and will follow the existing contours of the site. Seating will be provided within the park and steps and there will be new lighting in the park to provide a safe route during the evening. Wildflowers will be planted, such as snowdrops, bluebells, wood anemones, wild garlic and cow parsley, to enrich the existing habitat on the site, provide seasonal change and encourage greater diversity of habitat for wildlife. The final stage of restoring the park is being carried out by Dunkil Developments Ltd and is scheduled to take approximately three months subject to weather conditions.